Welcome, welcome, welcome….and well done for even thinking that running might be the sport for you, that in itself should be congratulated because running often gets a bad press really, and can seem very daunting at first, especially if you don’t quite have the body of Paula Radcliff. Oh and apologies for the dodgy picture, I have a terrible habit of pulling strange faces when I run…you may find yourself doing the same…or maybe not, I don’t want to scare you off before you get started. But you are here, so that is step one out of the way….a massive step by the way. So why is running so popular? In fact last week I wrote a blog post entitled Its OK to be a little bit rubbish at running, because sometimes we put so much pressure on ourselves to see improvement all of the time and we think we are the only runner out there still huffing and puffing and finding it tough…its supposed to be tough, that’s your body working hard after all. So if this is your first time to this site, and maybe even the first time you are seriously considering the sport what do you need to know? Get sign off from your doctor – It may be a good idea to check with your GP that there isn’t any serious reason you shouldn’t run. Be mindful that not all doctors are pro running, some are very anti running, so they may suggest you try something easier like walking or swimming, but stick to your guns and tell your doctor you really want to give running a try and see what they say? Get out the front door – You can think about it, talk about it and plan for it for as long as you like, but you won’t see any progress until you bite the bullet and actually go for your first run. OK, it might not be pretty, you might have to walk some of it and that might make you feel a little crap, but remember this is only your starting point, and from here on in, it can only get easier. So there you have it, everything you need to prepare you for that first run. Pop over to our friendly facebook page and get involved in our community of plus sized runners, many of whom have been exactly where you are right now. Enjoy and congratulations on becoming a runner…well almost, oh and one thing before you leave, we run a FREE virtual 5k each month called One Big Fat Run, why don;t you think about signing up for that? You don;t need to be able to run it all, you can even walk it if you like, and 5k is probably equivelent to an efternoon walking around the shops, so you would probably get round in about an hour even if you stroll round. And for those of you who have been at it for a while, why not leave a message of support or some words of advice for new comers to this site, and to the marvelous sport of running? I started running over 12 months ago, I was very slow and did the walk/run thing. 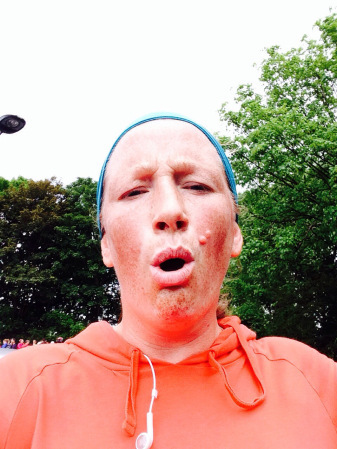 I signed up to a half marathon, on a whim and really crapped my pants then. I started running 2.5 miles a day and doing a longer run on a Sunday building up to 10 miles. Don’t give up ladies, but definitely get a sports bra. If I can run 13.2 miles, trust me, you can. Like Lynda I started, this time last year, alternating running and walking between lampposts. Year later and just entered my first 10k. Get started today and you will be amazed at how far you can get by just building up slowly but surely……come and join us on Facebook too – really supportive and great to have virtual running buddies! I started with wearing one bra over the top of another and it gave me enough support, I think that point was more about not using kit as an excuse. How do you know if your bra is supportive enough unless you get out and run.